Tribest Slowstar Vertical Slow Juicer and Homogenizer is a quiet single auger juicer that slowly and easily juices your favorite fruits and vegetables from apples and oranges to carrots and leafy greens. The Slowstar has a low speed of 47 RPM with a 200 Watt motor and 3 reduction gears resulting in the equivalent amount of torque as a 9 HP motor. 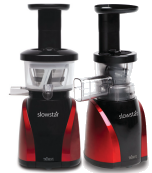 The Slowstar creates more than twice the power compared to similar slow juicers that run at 80 RPM with a 150 Watt motor, which produces the torque of a 4 HP motor. The low 47 RPM ensures that you will not lose the freshness, quality, and enzymes in your juice due to friction and heat. The Double-Edged Duoblade Auger makes it possible for Slow-star to rapidly cut and juice your produce at a low speed for higher yields and reduction of pulp in the juice. *NEW* Spout Cap prevents dripping on your counter with the included spout cap. The spout cap will also allow you to mix small quanities of juice inside the bowl of the juicer before it is released into the collection cup. 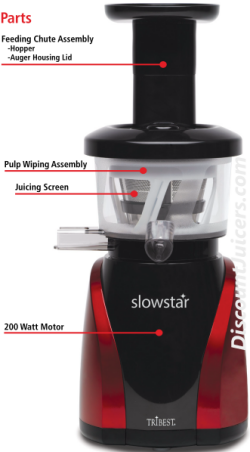 DiscountJuicers.com is the FIRST retailer to offer you the NEWEST version of the Slowstar juicer with all current upgrades including the Spout Cap. Other retailers may not have the model with the spout cap for several weeks. Not only can you juice your fruits, vegetables and leafy greens with the Slowstar, but you can also homogenize and mince your ingredients to be used for any of your favorite recipes. 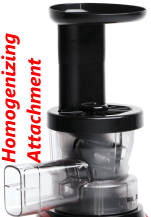 Homogenizing Attachment is INCLUDED with the Slowstar Juicer. Just simply replace the top of the machine with the Homogenizing and Mincing attachment to turn the Slowstar into a multi-purpose tool that allows you to create your favorite recipes like sorbets, nut butters, pates, salsa, sauces and more! Whether you are juicing your favorite fruits and vegetables or using the Homogenizing Attachment to make sauces or sorbets, the Slowstar is the perfect solution to allow you to include more healthy fruits and vegetables into your diet. Unlike other slow juicers out on the market, the Slowstar has a double-edged Duoblade auger that creates a double-cut for less jamming and less pulp in your juice. The Duoblade easily breaks down stringy, fibrous produce and leafy greens such as kale, celery, and wheatgrass. Having two edges allows the Duoblade auger to do twice as much work as a traditional auger, which means it only has to spin at 47 RPM to juice the same amount of produce per minute. The lower speed preserves more nutrients and produces juice with less foam, all while producing a greater juice yield. creates more than twice the torque force compared to all other slow juicers. With twice the torque, the Slowstar makes your crushing, mincing, and homogenizing jobs smooth and effortless. Makes a less pulpy juice than similiar vertical juicers. Includes 100% Stainless Steel Pulp Strainer for additional pulp elimination from your juice!